Akbari, A., Homayoonfal, M. (2009). Fabrication of Nanofiltration Membrane from Polysulfone Ultrafiltration Membrane Via Photo olymerization. International Journal of Nanoscience and Nanotechnology, 5(1), 43-52. A. Akbari; M. Homayoonfal. "Fabrication of Nanofiltration Membrane from Polysulfone Ultrafiltration Membrane Via Photo olymerization". 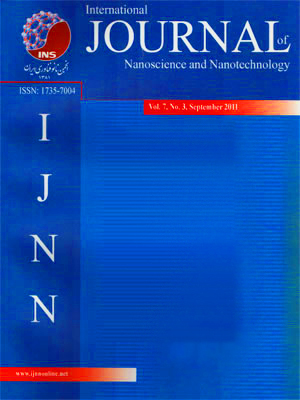 International Journal of Nanoscience and Nanotechnology, 5, 1, 2009, 43-52. Akbari, A., Homayoonfal, M. (2009). 'Fabrication of Nanofiltration Membrane from Polysulfone Ultrafiltration Membrane Via Photo olymerization', International Journal of Nanoscience and Nanotechnology, 5(1), pp. 43-52. Akbari, A., Homayoonfal, M. Fabrication of Nanofiltration Membrane from Polysulfone Ultrafiltration Membrane Via Photo olymerization. International Journal of Nanoscience and Nanotechnology, 2009; 5(1): 43-52. UV-induced grafting technique was used as a flexible method for surface modification of Polysulfone (PSf) ultrafiltration (UF) membranes in order to prepare hydrophilic nanofiltration (NF) membranes. Flat sheet Polysulfone (PSf) ultrafiltration membranes were prepared via phase inversion method. N-methylene-2-pyrrolidone (NMP) and polyethylene glycol (PEG) of three different molecular weights (MW) (200, 400 and 600 Da) were used as solvent and the polymeric additive in casting solution respectively. Effect of PEG MW and grafting conditions including monomer concentration and irradiation time on membrane performance as pure water flux (PWF), salts rejection and PEG retention at 300 kPa operation pressure was studied. Several surface analytical techniques including FTIR-ATR, SEM and AFM were used to characterize the changes resulting from modification. The results showed PWF drastically decreases and salt rejection increases where monomer concentration and irradiation time are increased which corresponds to a decrease in pore size from 3.42 to 2.62 nm. According to AFM photographs the RMS roughness of this membrane is 2.3 nm which is in NF range.